All organisms have to reach a certain stage of growth and maturity in life, before they can reproduce sexually. The period of growth before onset of sexual maturity is called juvenile phase. This phase is called vegetative phase in plants. The end of juvenile/vegetative phase marks the beginning of reproductive phase. In many plants, vegetative phase and reproductive phase occur frequently in alternation. Both juvenile phase and reproductive phase are of variable durations in different organisms. The females of placental mammals exhibit cyclical changes in the activities of ovaries and accessory ducts as well as hormones during reproductive phase. Such cyclical changes are of two types, viz. oestrous cycle and menstrual cycle. Many mammals are reproductively active only during certain periods in a year. Some other mammals, are reproductively active throughout the year. Oestrous Cycle: The cyclical changes in females of non-primates during reproductive phase are called oestrous cycle. In this case, the animal resorbs the endometrium in case pregnancy does not happen. Menstrual Cycle: The cyclical changes in females of primates during reproductive phase are called menstrual cycle. In this case, the animal sheds the endometrium in case pregnancy does not happen. Endometrium is shed in fragments along with blood by means of menstrual flow. Senescence or Old Age: The end of reproductive phase is considered as one of the parameters of senescence or old age. Metabolism slows down and many other changes take place during old age. The events in sexual reproduction can be grouped into three distinct stages, viz. pre-fertilisation, fertilization and post-fertilisation events. Pre-fertilisation Events: All events of sexual reproduction prior to the fusion of gametes come under pre-fertilisation events. The two main events during this stage are gametogenesis and gamete transfer. Gametogenesis: The process of formation of two types of gametes is called gametogenesis. Gametes are haploid cells. 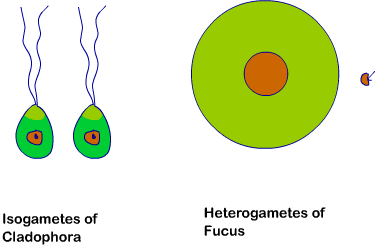 In some algae, the two gametes are so similar in appearance that it is not possible to categorise them into male and female gametes. Such condition is called isogamous condition. But in majority of sexually reproducing organisms, the gametes are of two morphologically distinct types. Such condition is called anisogamous or heterogamous condition. The smaller gamete is the male gamete and is called antherozoid or sperm. The larger gamete is the female gamete and is called the egg or ovum. Sexuality in organisms: Sexual reproduction generally involves the fusion of gametes from two different individuals. But there are many organisms in which a single individual produces both types of gametes. This is the bisexual condition. Many flowering plants produce bisexual flowers which produce both types of gametes. A bisexual animal is called hermaphrodite animal. Other organisms show unisexual condition in which different gametes are produced by different individuals. In flowering plants, unisexual flowers can be pstillate or staminate. A flower which produces only the male gametes is called staminate flower. A flower which produces only the female gamete is called pistillate flower. Cell division during gamete formation: We know that all gametes are haploid. The parent plant body can be either haploid or diploid. All animals are diploid. A haploid parent produces gametes by mitotic division, whereas a diploid parent produces gametes by meiotic division. Many organisms belonging to monera, fungi, algae and bryophytes have haploid plant body. But organisms belonging to pteridophytes, gymnosperms, angiosperms and most of the animals have diploid parent body. In diploid organisms, specialized cells called meiocytes (gamete mother cell) undergo meiosis to produce gametes.